Rhododendron is an attractive, blooming bush in many landscapes and is fairly low maintenance when planted properly. Growing Rhododendron successfully requires the proper planting spot. Proper soil preparation is also necessary for the health of this acid loving plant. Soil preparation is best accomplished in autumn before planting the Rhododendron in spring. When to plant it will depend on the USDA zone in which it grows. Growing Rhododendron is an exacting task, but with the right soil and location, it will provide an optimum performance. Unlike many blooming plants, Rhododendron does not like full morning sun in winter and does best when planted in dappled shade on the north side of a building. Growing Rhododendrons are happiest in a location protected from the wind and not under eves of a building. Plant the Rhododendron bush in spring when danger of frost has passed. Plant the bush high in properly prepared soil, as soggy and waterlogged roots are the main cause of plant failure in the landscape. Rhododendron will likely be purchased as a containerized plant or a balled and burlapped specimen. The root ball should be soaked prior to planting. Moisture is required for proper care. Place the plant in a tub or bucket for a brief soaking, until air bubbles disappear. Plant the bush so that its crown is at the same level as in the pot. Correct soil pH for the growing Rhododendrons is crucial. Between 4.5 and 5.5 on the pH scale is appropriate. A soil test is the best way to determine the pH of the soil and make amendments. Aluminum sulfate should be avoided when amending beds for growing Rhododendrons. Rhododendron is best planted in groupings in prepared beds as opposed to individual planting holes. Caring for Rhododendrons will be simpler if they are planted is moisture retaining but well-draining, loamy fertile soil with the proper pH. A 50 percent ratio of organic matter is encouraged as a soil amendment, as it provides aeration and drainage and allows the bush to set higher. Once properly located in the planting bed, water thoroughly and cover with an organic mulch which will break down to supply nutrients as it decomposes. A pine bark covering applied at 2 inches (5 cm) is thought to inhibit fungi that cause root rot. Do not mulch with peat moss, as it is difficult to rewet after it has dried out. Proper mulching will decrease the need for future care. 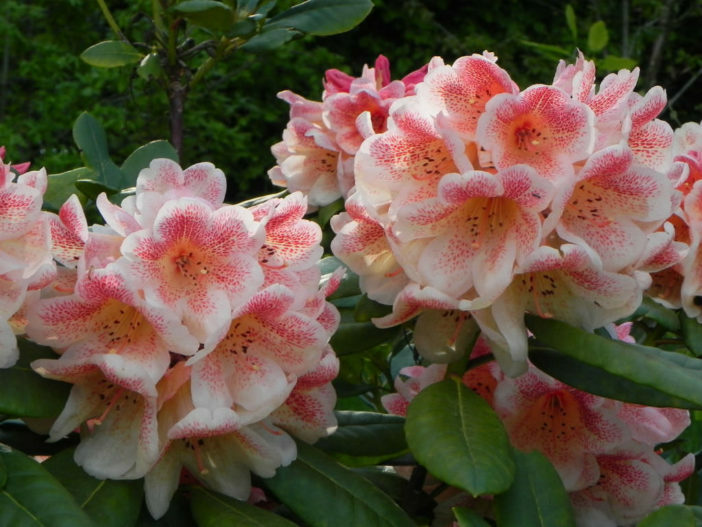 Rhododendron care includes a yearly fertilization which is best applied in fall, following a hard freeze or in early spring. Use a fertilizer for acid loving plants, such as organic cottonseed meal. The organic material you have worked into the soil previously will break down to provided some of the necessary nutrients. Consistently moist soil is needed for proper care, but too much water creates problems for the growing Rhododendron. When leaves curl and twist, this indicates that water is needed immediately. The bush should not be allowed to go through the stress of wilting. Growing healthy and long-blooming Rhododendrons starts with properly amended soil and planting in the correct location. These steps ensure minimal effort when caring for Rhododendrons. Once sited properly, the Rhododendron needs only adequate watering, pruning and deadheading of the flowers to encourage their abundant return.